Built by the citizens of Krakow in 1823, the verdant Kosciuszko Mound is as revered as it is beautiful. One of four mounds in Krakow, it sits on top of Blessed Bronislawa Hill in honor of Polish national hero Tadeusz Kosciuszko. The hollow mound is modeled after the city’s prehistoric Krak and Wanda burial grounds and made from soil brought from towns all over Poland. Inside, are urns with soil from the battlefields where Kosciuszko fought. Visitors can follow a serpentine path to the top of the hill, where they will find a granite boulder inscribed with Kosciuszko’s name and spectacular views of the city and neighboring Tatra Mountains. Next to the mound is a museum that displays artifacts relating to Kosciuszko, who fought in the American War of Independence and later inspired an uprising against foreign rule in Poland. Visitors may also be interested in the neo-Gothic Chapel of St. Bronislawa, which contains several objects related to Kosciuszko, as well as the surrounding fortifications which include additional historical exhibitions. 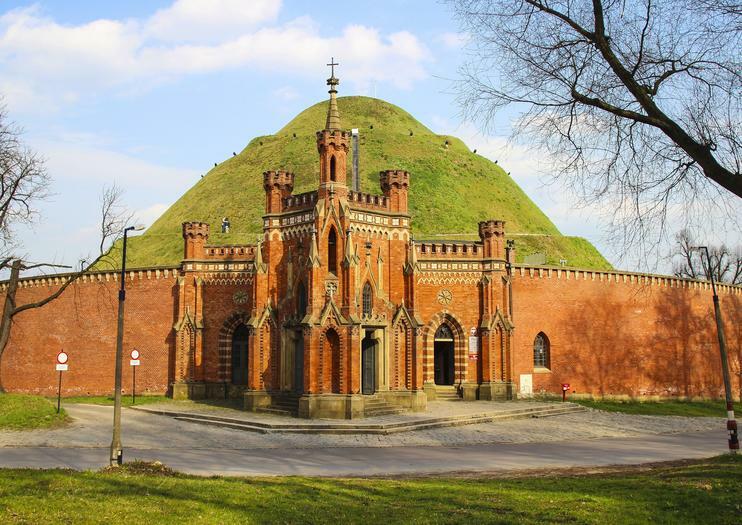 The Kosciuszko Mound is located in Krakow's Zwierzyniec District, and is open daily from 9:30am to dusk. To reach the site, take tram 1, 2, or 6 to the Salwator stop and catch bus 100 to the top. If you’d rather walk, it is about one mile (1.6 km) uphill from the tram stop. A taxi from Krakow’s Old Town costs about 30 PLN. A ticket to the Mound includes all of the adjacent attractions and exhibitions. Kosciuszko Mound was erected in the 1800s as a dedication to a Polish military hero—Tadeusz Kosciuszko. As well as a memorial, it boasts incredible views of the city’s most loved landmarks such as Wawel Castle, St. Mary’s Basilica, and the Main Square. You’ll save time waiting in long visitor lines by having your ticket provided, and the ticket will also get you access to Kosciuszko exhibition, the Fortress Museum, and the Polish Road to Freedom exhibition too. Explore Krakow’s major sights at your own pace with a 1- or 2-day hop-on-hop-off bus tour. Take in the views from a double-decker bus and learn about local history through recored audio commentary, hopping off and back on at any of 10 different stops to design your own perfect day in one of Poland’s most beautiful and historic cities. If you've already seen Krakow's major sights, try something different with this private tour that takes you off the beaten path. Take in commanding views of the city and see the remains of an old fortress from the top of the famous Kosciuszko Mound, and then head out of town to visit a medieval Benedictine abbey in Tyniec that overlooks the Vistula River. Learn about the legends of the abbey and the life of the monks there from your private guide, and admire a 17th-century monastery along the way. Make traveling to Krakow a breeze by having unlimited access to over 25 Krakow tours, activities, museums, and experiences. With Pass4Krakow, you’ll save hours waiting in long ticket lines for separate attractions, as you’ll have access to all available options via an app. Choose from Auschwitz-Birkenau, Wieliczka Salt Mine, Schindler’s Factory, and more. You won’t get stuck on lengthy day tours, and instead, you can plan to visit only the places that interest you. The world seen from the air is a different world. It seems that you know the area and yet after rising into the air, the views are breathtaking. Choose the route and places you want to see, and we will do our best to enjoy the beautiful panorama from the deck of the helicopter and reach the places you have always wanted to visit. A flight over the tops of the mountains, landing on a forest glade or on the lakeside give a sense of freedom and a completely different view of the beauty of our country. We are open to your ideas, so share them with us and we will make them implement them.